Summer is officially here now that tomatoes are available at my local farm!! I love this time of year and we eat fresh tomatoes as often as we can during the summer. In fact, there are several recipes I will only make when local organic tomatoes are available. They make all the difference in the final product! In addition to tomatoes, we picked up some sweet Maui onion, corn, broccoli, cilantro, peaches, and plums. Better yet, we have basil and cucumber right from our own backyard! 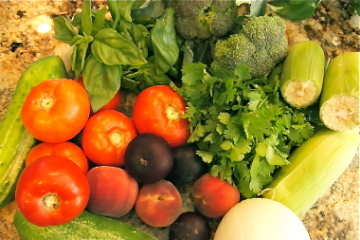 With this wonderful bunch of produce, I will be making the following meals this week.